For example, a PC could have a media server installed which would expose a ContentDirectory service, containing functions such as Browse and Search. Similarly, a TV could expose an AVTransport service (to play media) and a RenderingControl service (to control the device itself). 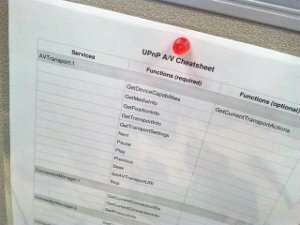 UPnP/AV Device Capability Database: A user-generated collection of UPnP data from real devices. DLNA Certified Product Search: DLNA-certified means some UPnP services should work. This entry was posted in Other and tagged cheatsheet, devices, DLNA, network, UPnP on 15 November, 2012 by Daniel.